How do you get cut through red tape to address pressing urban issues that affect millions of citizens? In this episode of Mastering Innovation on Sirius XM Channel 132, Business Radio Powered by The Wharton School, guest Gabe Klein, co-Founder of CityFi, discussed how the company works domestically and abroad to drive changes in transportation, sustainability, healthcare, and other pressing challenges. Klein touted the benefits of public, private, and nonprofit collaboration to solve problems. By removing bureaucratic hurdles and pre-qualifying firms to work with the government, they give firms the license to innovate on a level they previously were not able to. He reflected on his time working in both the private and public sectors (at ZipCar, then in public service for Chicago and Washington, D.C.) and called attention to the need for more cross-pollination of ideas between the two. He also discussed how CityFi strives to incentivize the private sector to adopt a triple bottom line and think beyond profits to invest in the greater good of the city. Saikat Chaudhuri: You’ve launched this company, CityFi, and you work with various cities including L.A. and Nashville. To get us situated, what kind of work do you do and have you done in that capacity? Gabe Klein: Yes, we work all over the country and even outside of the country. Today I’m in Miami working with Miami-Dade, which is a very large, 445-square-mile area with pretty in-depth transportation issues in the city. We also work in Singapore. We really enjoy working with the public sector and private sector and finding ways to bring them together to partner around innovation, always with an eye towards human-centered design. We emphasize the idea that people, planet, and profit should always be at the center of the equation for future progress. So we try to build future-proof plans for our clients that give them on-ramps and off-ramps, allowing them to be successful in a rapidly changing world. Chaudhuri: The global dimension is interesting to me because you have so much experience here in the domestic setting. In particular, Singapore is known for being one of the pioneers and front-runners of really promoting the triple win that you just described, and having the city of the future. Klein: Singapore is amazing. What I really love about Singapore is their ability to try things out and test them. They basically will partner with the private sector in ways that other cities won’t and, of course, they’re a city-state, but they are a country as well. When I’ve been over there, I’ve been really impressed with their ability to use things like behavioral economics to get people to change the way they move. A lot of us here think, “Okay, we have a congestion problem in our city. We need to build something new to deal with it.” Whereas they say, “How could we get people to think differently about how they move? What if we paid people to take the train 20 minutes later, or made their fare free, or gave people a Fitbit and paid them $30 a week if they hit their steps?” These types of alternative approaches are often tested in Singapore and then brought back to places like the United States. Chaudhuri: Fascinating. What are the kinds of things that you’re working on with them? These were some really fun and interesting challenges. I’m going back this year again to see what progress they’ve made. The world has changed a lot in two years in terms of technology: automated vehicles were just kicking off there last time I was there, they’ve done a few years of testing. It’s been very exciting to go back, and I’m also going to be going to the World Cities Congress, which is sort of a Mecca for innovation and cities, and that’ll be in a couple weeks in July. Chaudhuri: I remember seeing the autonomous vehicle test track in Singapore as well last year, so they’re actively working on that. What I like about what you’re describing is a couple of fascinating themes. One is the holistic approach that’s necessary: to think about everything around the needs of a person, what they need to do, and the general population. And at the same time, I also like the collaboration between the private sector as well as the public sector. It seems that major changes in something like transportation or the development and evolution of cities are only possible if you think about all those dimensions. Klein: Totally. And, you know, we’re very much for public, private, and nonprofit collaboration. The latest thing that we’ve really been working on in the city of L.A. and just in general in our thinking with our private and public partners is this idea of co-creation, the idea that we identify problems that we want to solve, like greenhouse gas target level, sustainability, or certain health outcomes. For instance, Singapore’s cost per capita for healthcare is half of ours, like $4400 versus $8800 here in the U.S.
We’re asking how we can take those outcomes and offer them up to the private sector and say, “Look, we know that you provide car share services, and we know that you provide LIDAR systems for autonomous vehicles. Instead of saying, ‘Here’s this really specific thing that we’d like you to do,’ we want to give you the license to innovate on a level that you may not have been offered before by government.” We want to remove the bureaucratic hurdles. We want to pre-qualify firms to work with the government. And so we’re going to come to partners and say, “Here’s our problem.” It may be health-related, not transportation-related, and they come back and say, “This is how we can solve for the real outcomes that you’re looking for. Not the symptoms of the symptoms of the problems,” which in America, we’re famous for trying to solve. For instance, we’re going to prescribe people a drug for their obesity problem instead of dealing with the fact that people are sedentary, drinking soda, and have mental health issues, and they’re living in a cul-de-sac away from everybody. We’re trying to really be honest and authentic about what the problems are and then co-create with the private sector the solutions, and that’s something that you have not previously seen government do. And I think with the speed that technology is hitting cities, this idea of true partnership — of aligning outcomes, incentives, and disincentives — is really the key of the future. Chaudhuri: That makes a lot of sense, and I like the alignment of all these pieces. Now, you talked a lot about the innovation and the change that you help orchestrate in these cities. That can’t be easy, right? There are certain processes and systems and mindsets that have existed for so long. How do you actually get them to think differently and then implement all these new things as well? Klein: A couple of things. One is, I have a saying that I probably say way too often, which is nothing easy is worth doing. If it’s hard, that makes the rewards so much bigger when you’re successful. And I’ve had the luck to spend most of my career in the private sector, but worked for two amazing mayors: Mayor Adrian Fenty in Washington and Mayor Rahm Emanuel in Chicago. I’ve had the opportunity to bring my skills to the public sector and create pretty massive amounts of change within those departments internally and externally. I’ve been able to empower people to take the lid off and move quickly and align people around these outcomes. And that’s basically what I did in D.C. and Chicago with these amazing teams of people that I had. So, is it easy? Absolutely not, and its complex, and it’s dirty. And it’s a lot of sausage making. There’s a lot of alignment that you need between different departments. And at the political level. It’s very hard, but really interesting and fun when you’re successful. And the good news is that most cities (there are some context-sensitive differences) are dealing with the same stuff. What we learned in Singapore we bring to Miami, and what we learn in Miami we bring to L.A. Increasingly there’s shared outcomes, shared problems between cities and shared learning, and we love helping them. Then we take it a step further when we say, “Okay, I know you’re not normally comfortable with this, but let’s bring the private sector into the room before we send out the RFP. Before we completely think through what we want, let’s bring in three, four, or five companies. And let’s say, ‘How would you address it? What are your solutions? '” The dialogue is so amazing. It leads to completely different outcomes than if we had bifurcated the process and not had this co-creation and cross-pollination of ideas. We’re really trying to break down those barriers. Gabe Klein is the former commissioner of the Chicago and Washington, D.C. Departments of Transportation. He has worked in variety of leadership roles in transportation and technology. 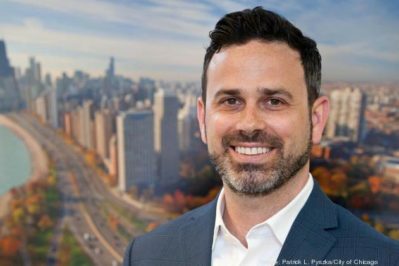 You can find more @Gabe_Klein and @TeamCityFi. You can get his book Start-Up City here.